The FutureCast Forum will help document and articulate our regional growth trajectory, discuss the issues and opportunities and measure the market pressures. 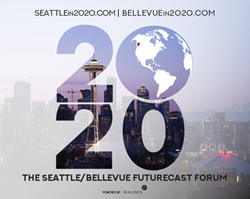 Representatives of Realogics, Inc. announced today the establishment of The FutureCast Forum – a collaborative of opinion leaders that explores both the current and projected market fundamentals influencing the Seattle/Bellevue metro area by 2020 and beyond. Its founding members and guest columnists will provide timely insights on the state of the economy, commercial and residential development, evolving demographics, wealth management considerations, government policy, lifestyle trends and international influences that are reshaping the regional landscape. In addition to Jones, the founding members include Trevor Bennett of Caliber Home Loans; Brian Bushlach of Feedback Media; Christian Chan of Burrard Group; Brian Evans of Madrona Financial Services; and Brian O’Connor of O’Connor Consulting Group. Several other members will soon be announced to cover other industry sectors. The FutureCast Forum notes the year 2020 as pivotal because it’s halfway to the Vision 2040 set forth by the Puget Sound Regional Council, which met in 2000 and estimated a population of 5 million people in the central Puget Sound region by 2040. Guests are welcomed to register for more information at http://www.Seattlein2020.com. A full web launch will be September 26, 2017. About Realogics and Realogics Sotheby’s International Realty (http://www.Realogics.com & http://www.RSIR.com) - Founded in 2002, Realogics, Inc. is a leading resource for market research, product development and marketing solutions for developer and lenders of residential and mixed-use projects throughout the Pacific Northwest. Realogics offers turnkey sales management services through its affiliated brokerage at Realogics Sotheby’s International Realty (RSIR). Recognized by the Puget Sound Business Journal amongst the fastest-growing private companies in Washington State for 2012, 2013, 2014, 2015 and 2016, RSIR is comprised of 225+ brokers that consistently rank among the top producing among their peers with branches in downtown Seattle, Bainbridge Island, Kirkland, Issaquah and Madison Park. EDITORS NOTE: Development renderings, neighborhood aerials and additional market statistics are available upon request.